← Take the time to enjoy the lights and decor of the holiday season with your family. Tell your family and friends you love and care about them often. Life is very precious and can change in a blink of an eye. Embrace every moment and tell your loved ones how you feel about them. 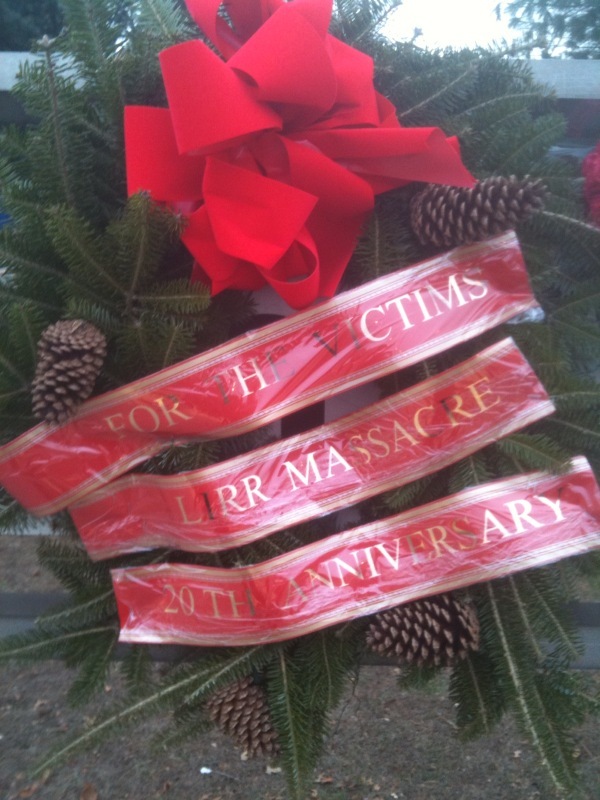 It’s hard to believe this past weekend was the 20th anniversary of the Long Island train massacre. While I was not on the train that day, that is my train station and the incident hits very close to home. The wreath in this post is a reminder of the six innocent people who were fatally shot as well as 19 injured on December 7, 1993. They were aboard a 5:33 p.m. rush hour train from Penn Station when a crazy man pulled out a gun and started firing at passengers. The point of this parenting life lesson is not to make you sad, but to remind you that you never know when you could be at the wrong place at the wrong time. Many of these people were on their regular commute home from work, but that day some of their lives were changed forever. So pick up the phone, write an email/card or drop by and pay a visit – the holidays are a perfect time to tell that special someone you care about them and love them. It’s nice for them to hear it even if you think they already know.